Bali Pasha Mosque: It was started to be built for Bali Pasha, one of the viziers of Sultan Bayezid ll (1481-1512) however, it was finished by his spouse Huma Hatun due to his death in 1495. Although it was reported that the mosque was a work of Mimar Sinan, it does not coincide with the era of Mimar Sınan according to its date of finish. 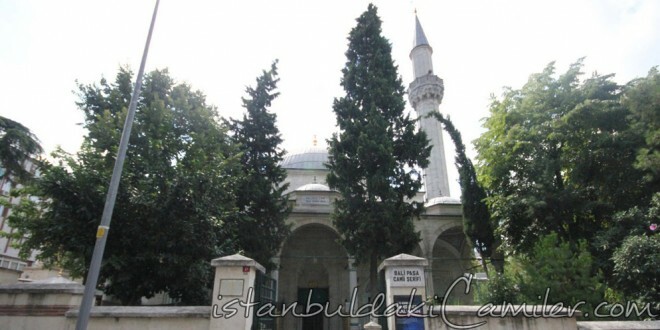 Yet, it is possibie that the mosque might have some annexes built by Mimar Sinan. It was built out of face stones in a square design. It was settled on an octagonal rim and has a twelve-metre high dome. Its portico and dome were ruined due to the Great Fire ot Istanbul. Its dome was re-built in 1935 when in was in a state of disrepair and its vvalls and interior were rebuilt and renovated in the oncoming years. Its minaret has a strip body that only exists in the works of Mimar Sinan. Its minbar was also built for Huma Hatun. Its ablution fountains and the tomb of Bali Pasha were lost in disrepair. Bali Pasha and his spouse Huma Hatun rest in here atthough the whereabouts of their burial place is not known for sure.